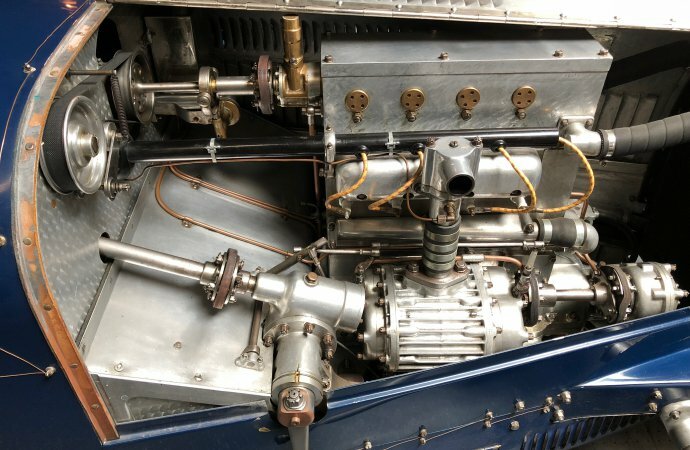 Jean Bugatti, the middle son of Ettore’s three, and the brilliant automobile body designer of most of the firm’s production, began with the 1932 Type 55. 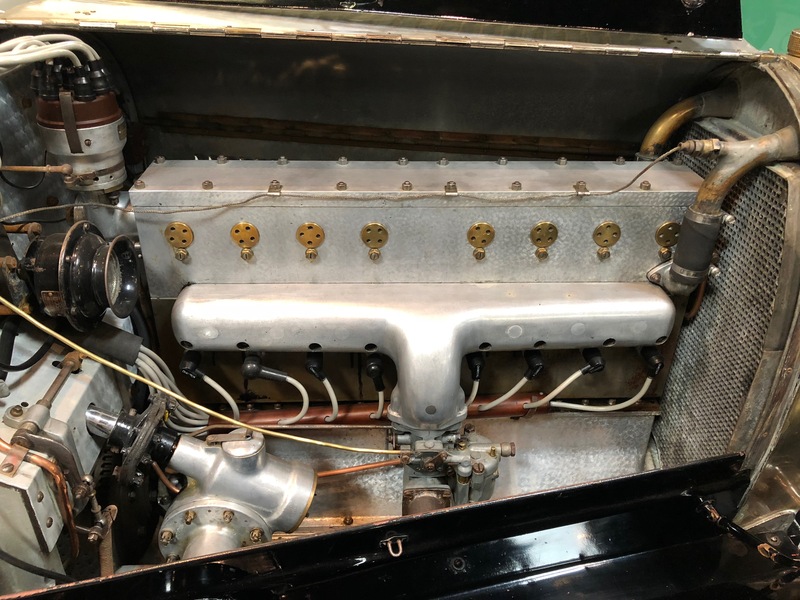 As with the Type 43, the sports car version of the sohc Type 35 grand prix car, the 1932 Type 55 was the sports car version of the twin-cam, supercharged Type 51 grand prix car. 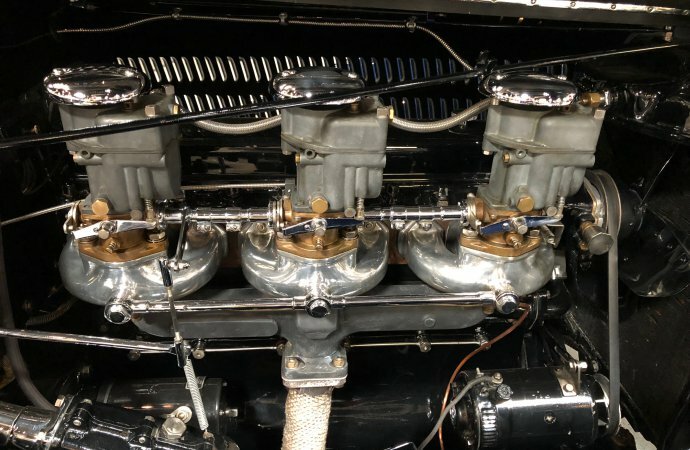 The Type 46 block was so robust, when Ettore and Jean Bugatti discovered the quality of America’s engine genius, Harry Miller’s, twin-cam 1.5-liter supercharged straight 8 (200 hp at 8,000 rpm in 1929), they duplicated its valve gear. 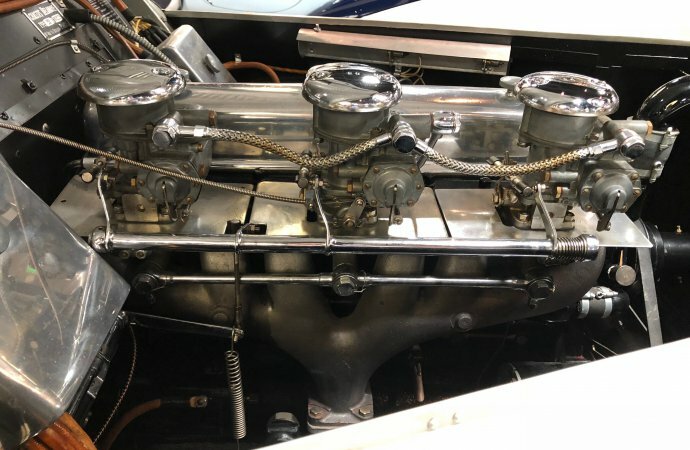 Griffith Borgeson, who purchased the two 91cid Miller front-wheel-drive cars from the Bugatti family in 1962, told the author the Bugatti and Miller valvetrain parts were interchangeable. 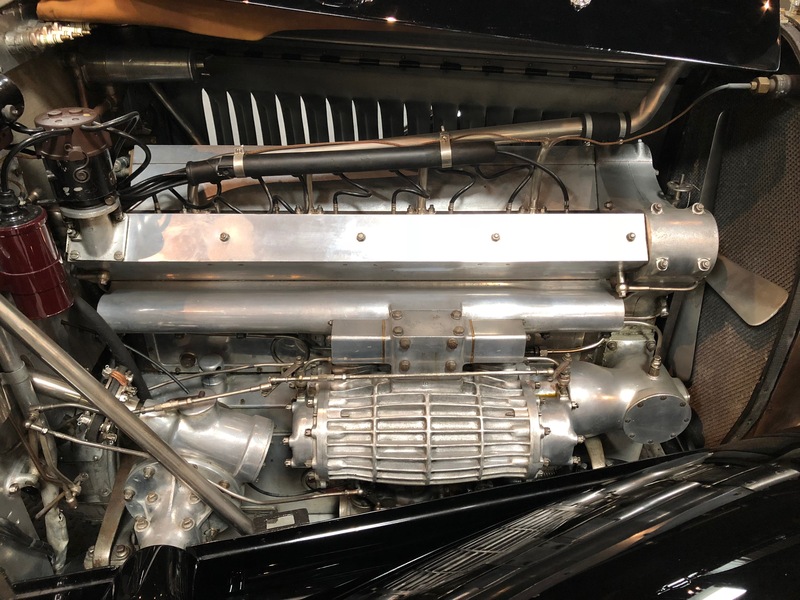 As the 1931 4.9-liter Type 50, the Type 46 block pattern received two cam towers and a supercharger, creating the most powerful production Bugatti to that time, 1931. 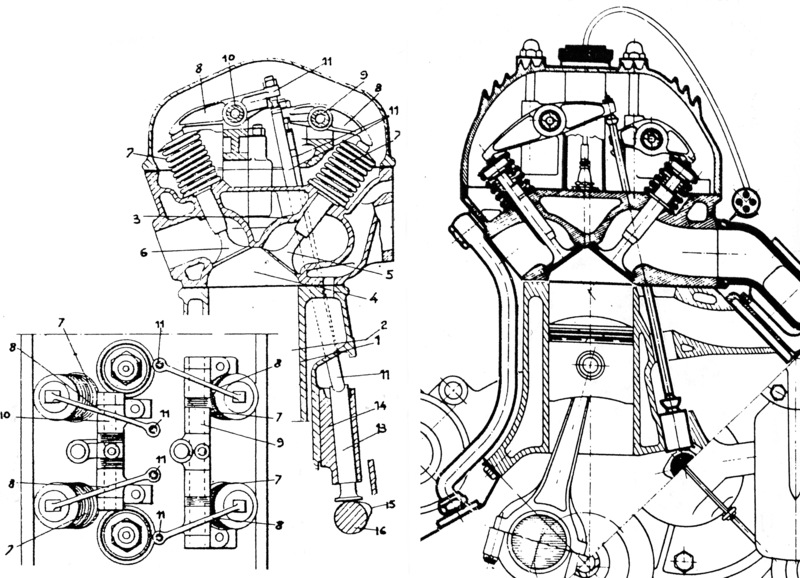 The drawings illustrate both the Miller 91 on the left (note the shallow water jacket for an engine that only ran at full speed — continual air flow) and the Type 50 Bugatti on the right (that had to slow and accelerate repeatedly during its road use). 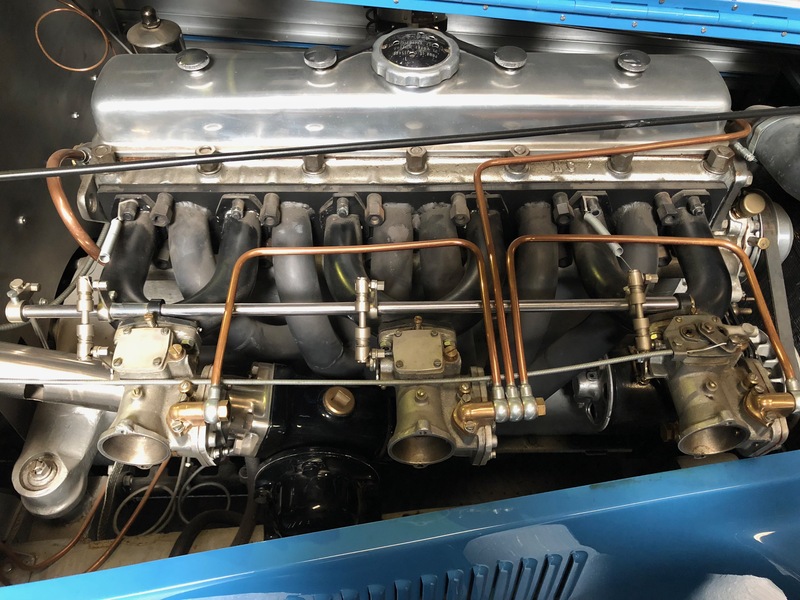 Anthony Lago hired Walter Becchia to modify the robust, simple flat head six in his British-built Talbot (Talbot-Lago in French production) as a high performance engine. 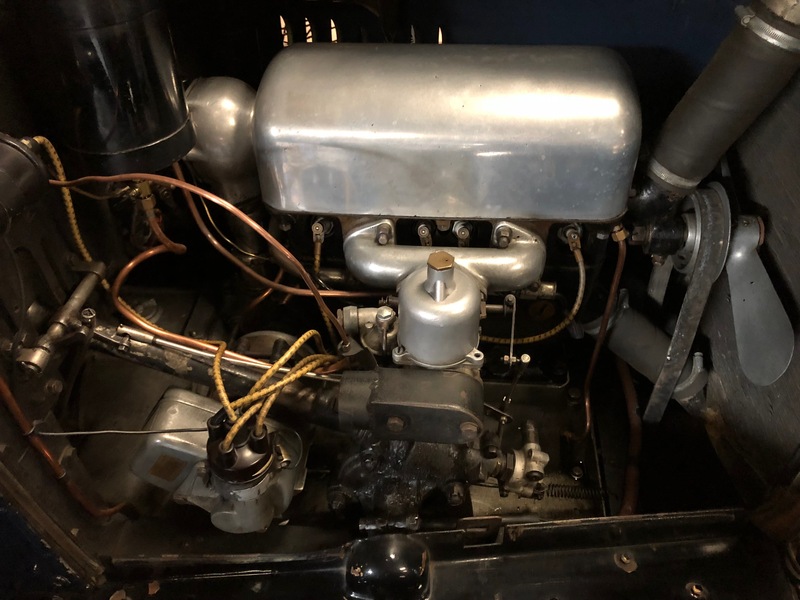 The elegantly simple aluminum head included hemispherical combustion chambers and pushrods and rockers to operated the angled valves. 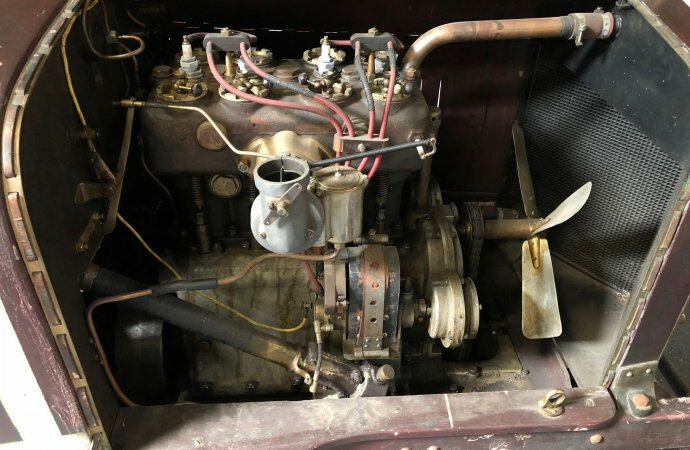 Zora Arkus Duntov worked on these engines as a young man and used a very similar set of elements in his ohv conversion for flathead Fords — the Ardun heads. 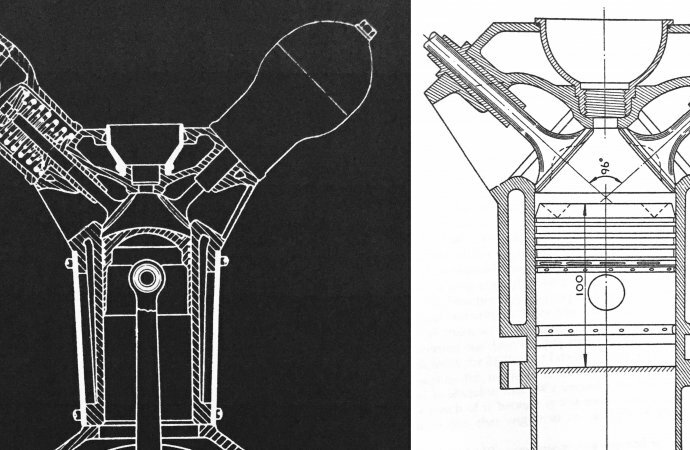 The drawings illustrate the similarities; Talbot-Lago on the left and Ardun on the right. 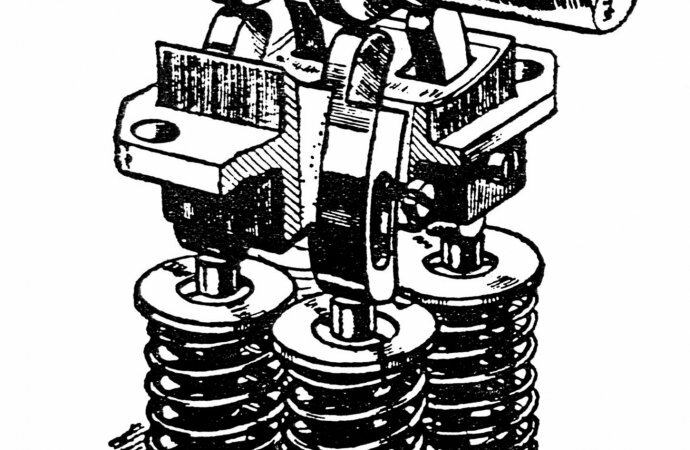 Note, in each case the pushrods reach the rockers through the original valve guide openings. 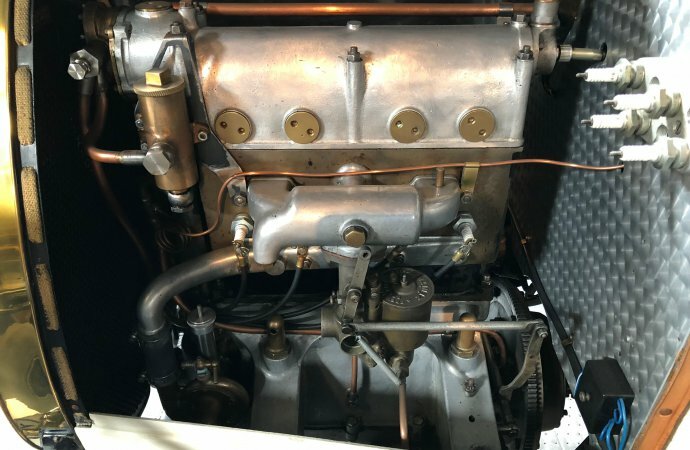 The 3-liter Delage version of the ohv 135 was called the D6-3L. 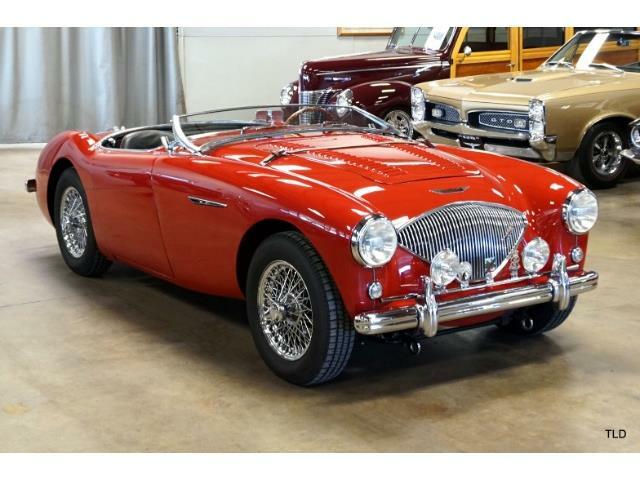 One of them finished second behind the failing 2-liter Ferrari that won Le Mans in 1949. 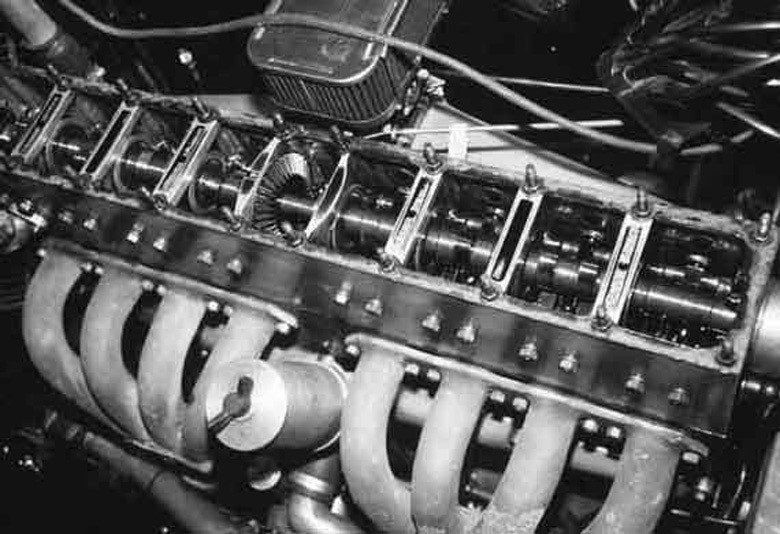 It is one of the great racing stories ever. 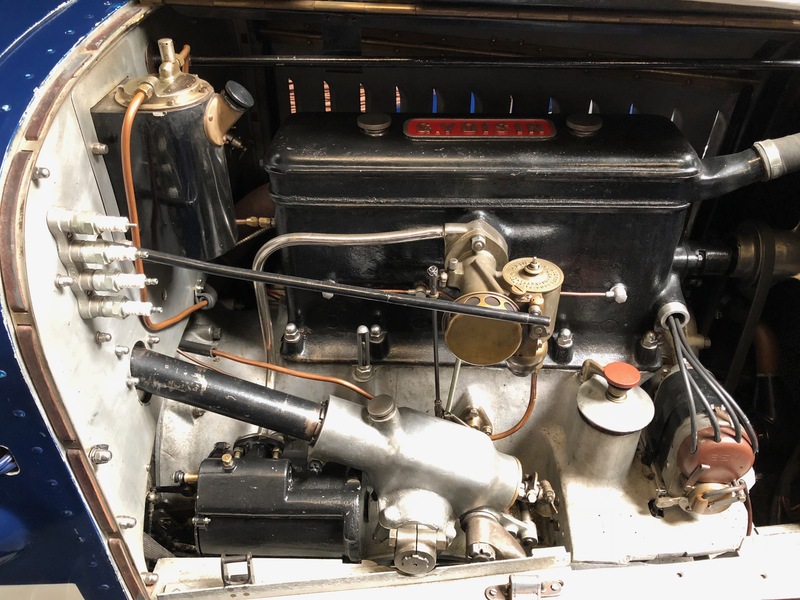 To make up its deficit laps at the end of the 24 hours, the Delage was driven like a grand prix car at the beginning of a race using maximum revs and lots of opposite lock. 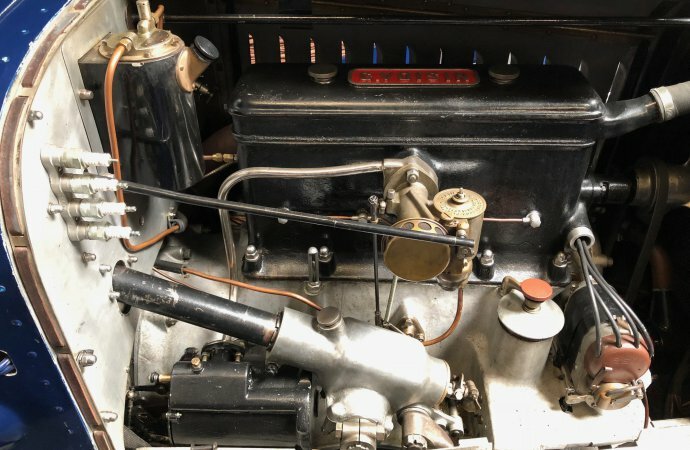 It finally finished on the same lap as the Ferrari, but Luigi Chinetti and the Ferrari won and put the Italian company on the road to fame and glory, while it takes some research to find the Delage story. 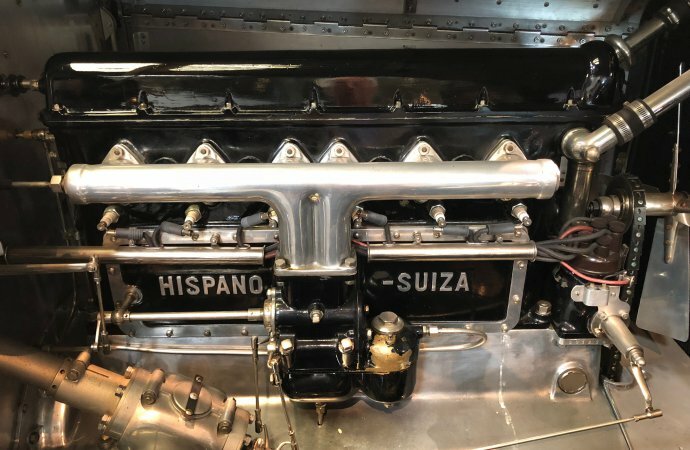 The 1911 Hispano Suiza 45CR 3.6 liter T-head “King Alfonso” is the seminal sports car. 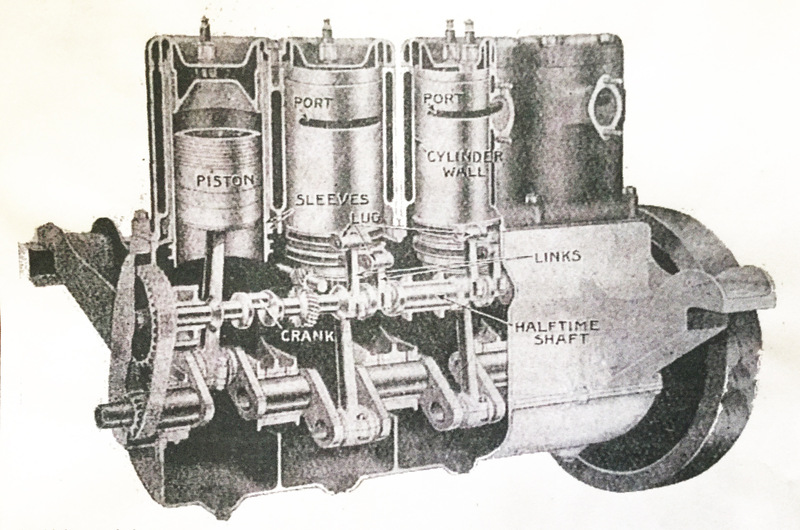 The T-head was the first high performance engine science. 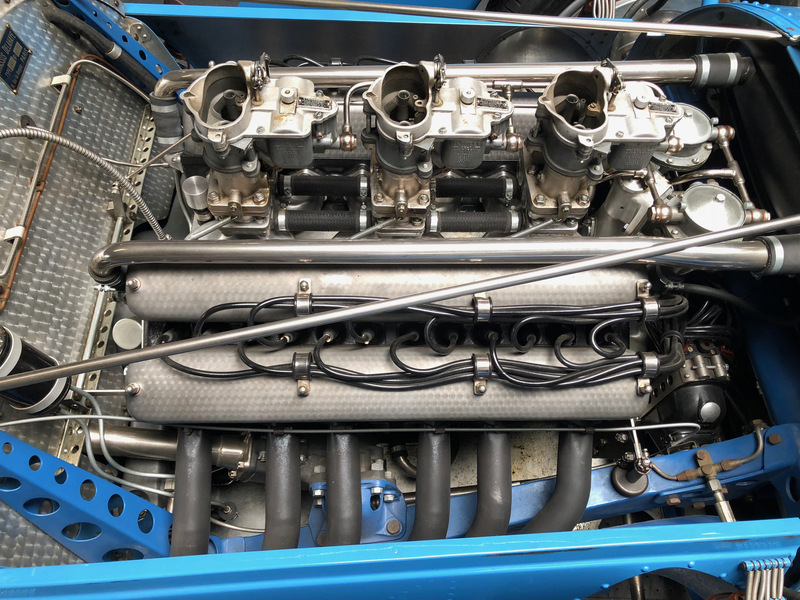 The two cams were in the crankcase pushing the valves open in intake and exhaust chambers on either side of the combustion chamber; air flow improved. 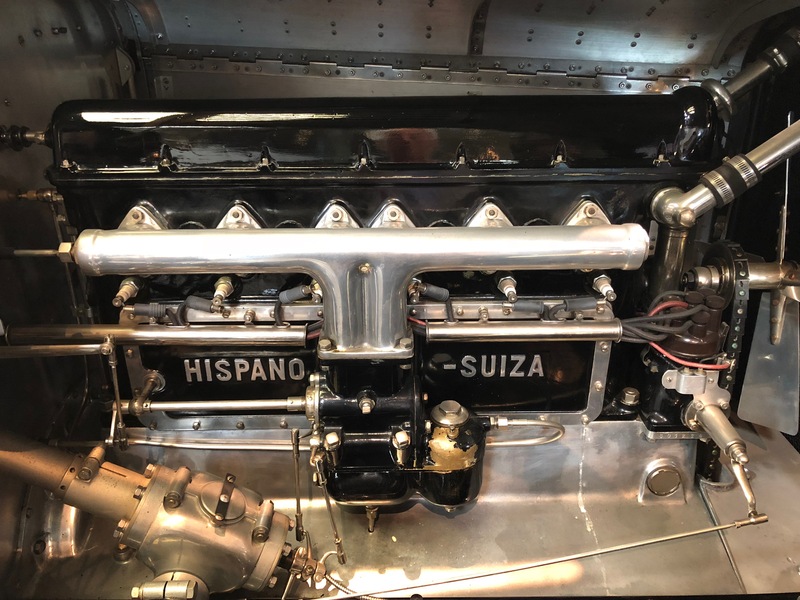 The T-head of the 1911 Hispano Suiza 45CR 3.6-liter was the first science-based high-performance engine. 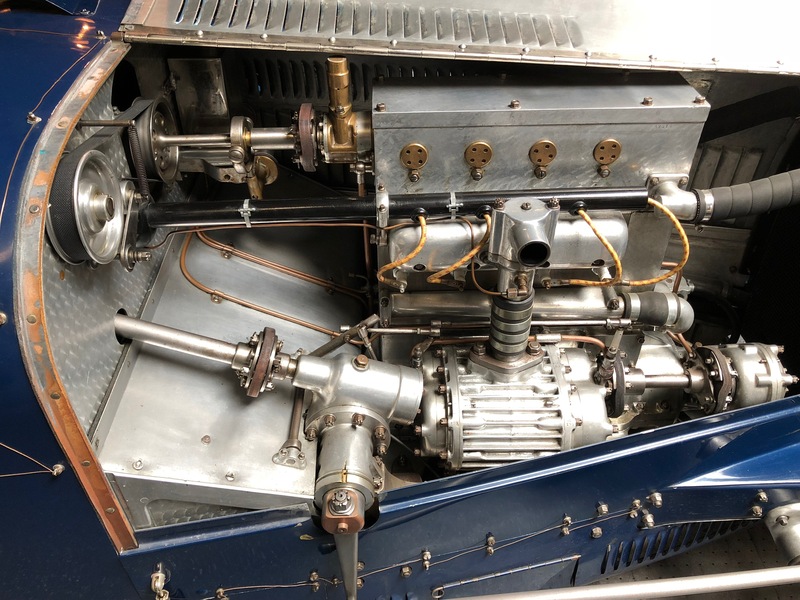 Bugatti’s legendary 1496 cc Type 13 16-valve sohc engine that dominated the 1921 voiturette race just outside Brescia, Italy. 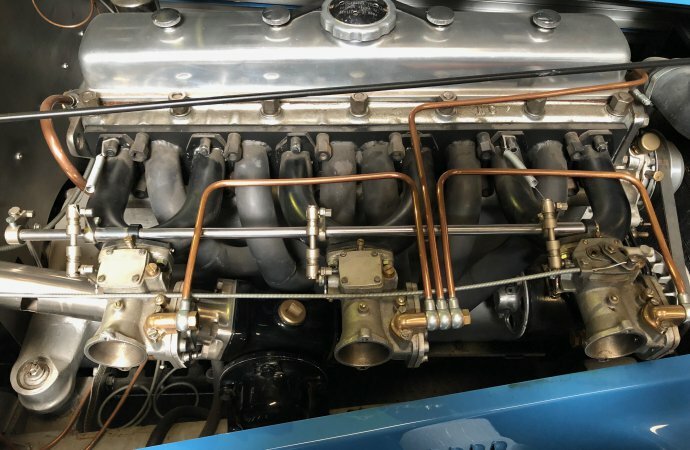 It continued to use Ettore Bugatti’s curious banana-shaped cam followers for each of the 16 valves. 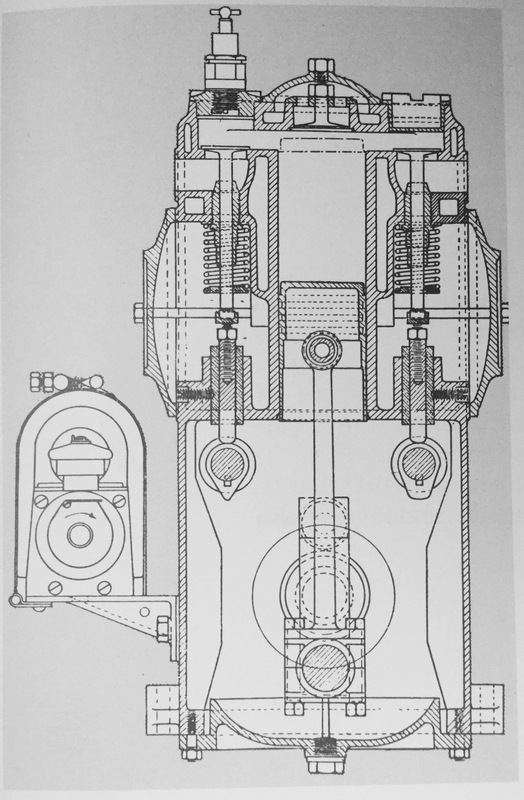 Bugatti used a vertical adjustable shaft (to adjust gear loads) with bevel gears at either end to drive his camshafts for all of its engines. 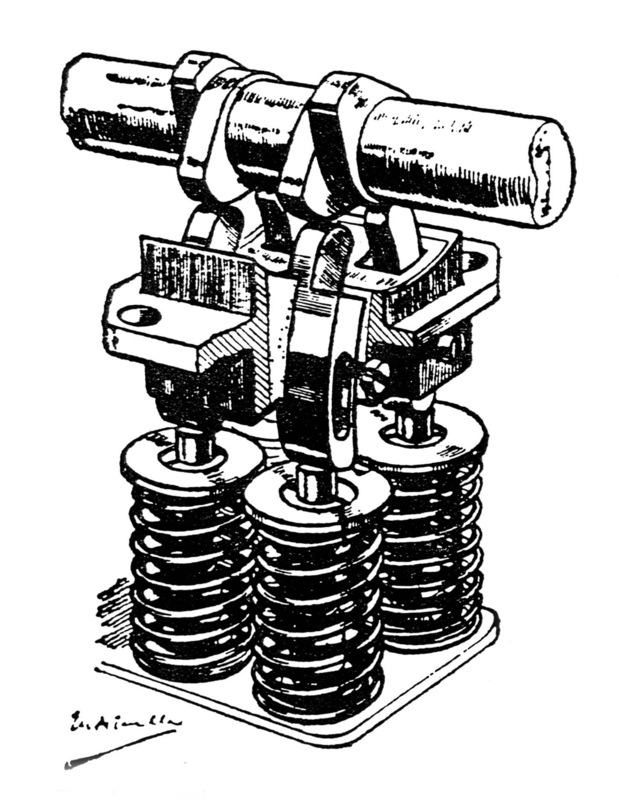 Note the small brass plugs for each cylinder where a feeler gauge could be inserted to check valve lash. 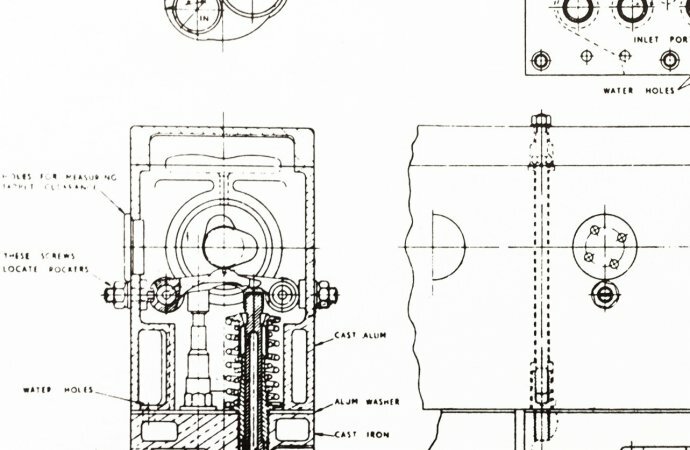 The small slotted screw and lock nut allowed the curved finger follower to be moved back and forth to adjust the lash. 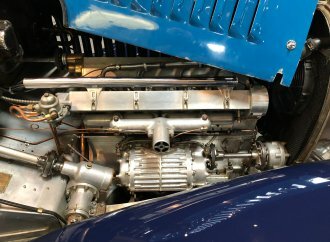 Bugatti’s legendary 1496 cc Type 13 16-valve sohc engine that dominated the 1921 voiturette race just outside Brescia, Italy. 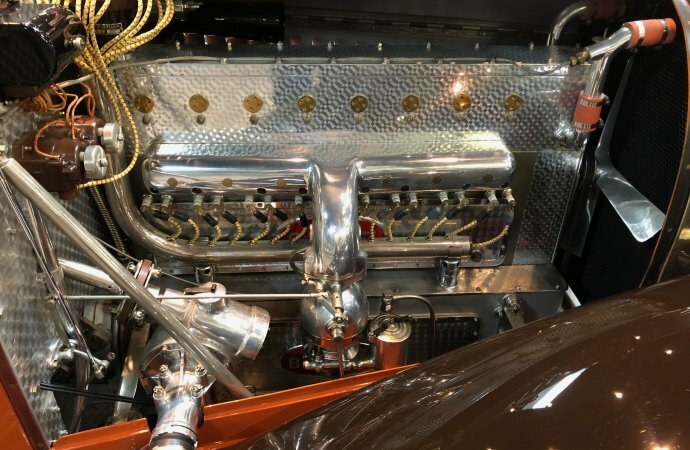 It continued to use Ettore Bugatti’s curious banana-shaped cam followers for each of the 16 valves. 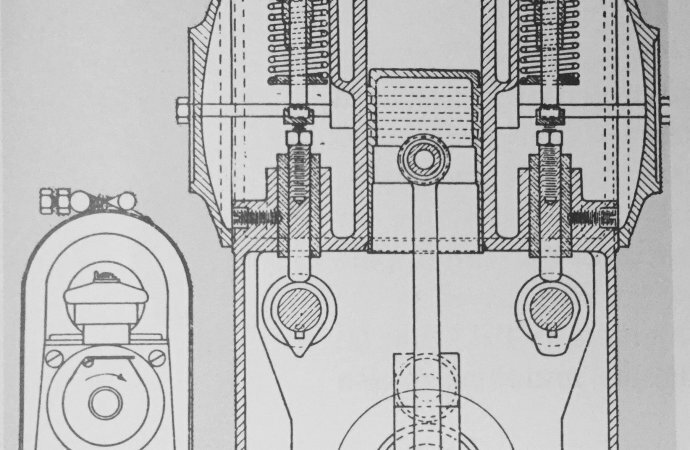 Bugatti used a vertical adjustable shaft (to adjust gear loads) with bevel gears at either end to drive his camshafts for all of its engines. Gabriel Voisin used the American Knight patented double sleeve valves for all his engines, beginning in 1919. 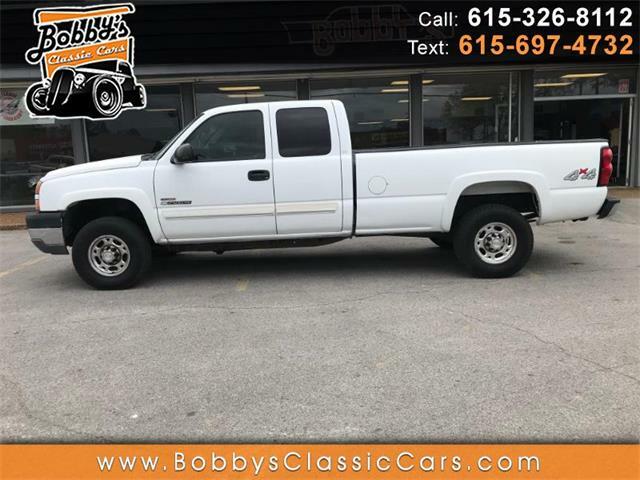 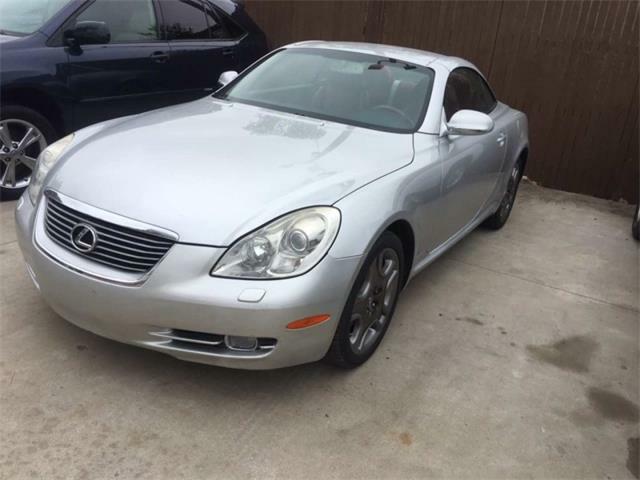 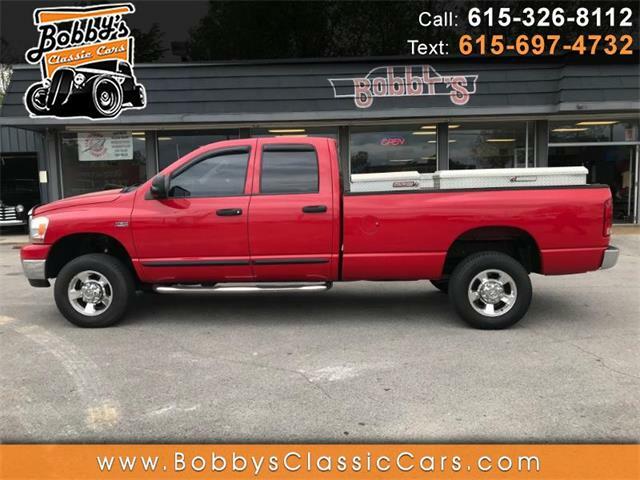 The system was created to reduce engine noise. 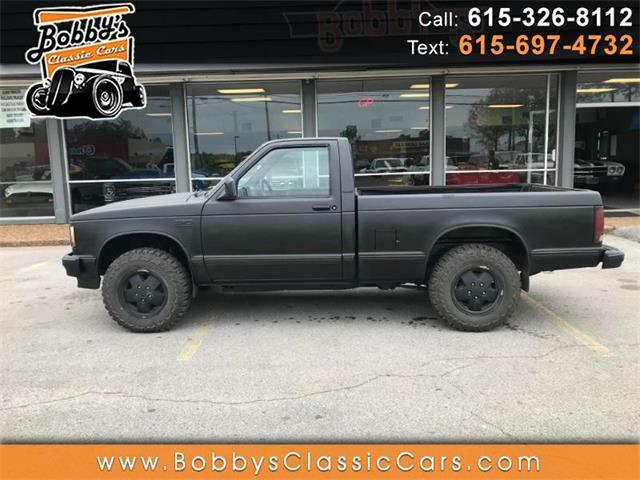 It did. 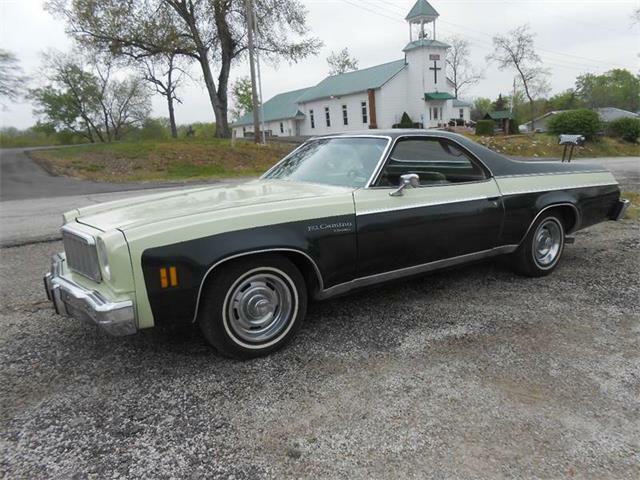 However, it did, also, have an adverse effect on oil consumption. 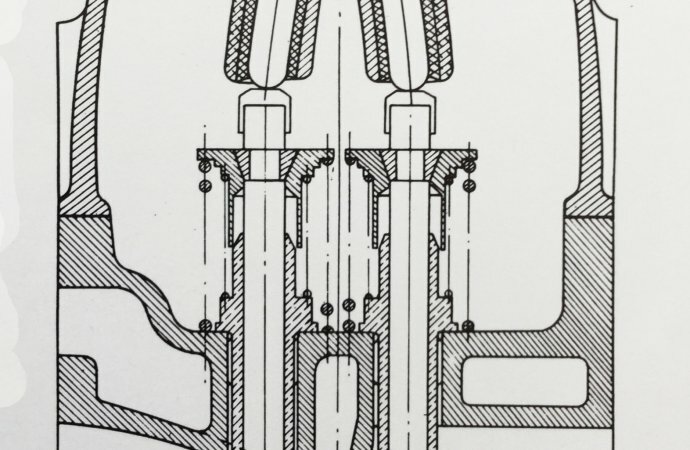 Consider the square centimeters of exposed metal between two sleeves moving in opposite directions within the cylinder — not to mention a piston inside the inner sleeve. 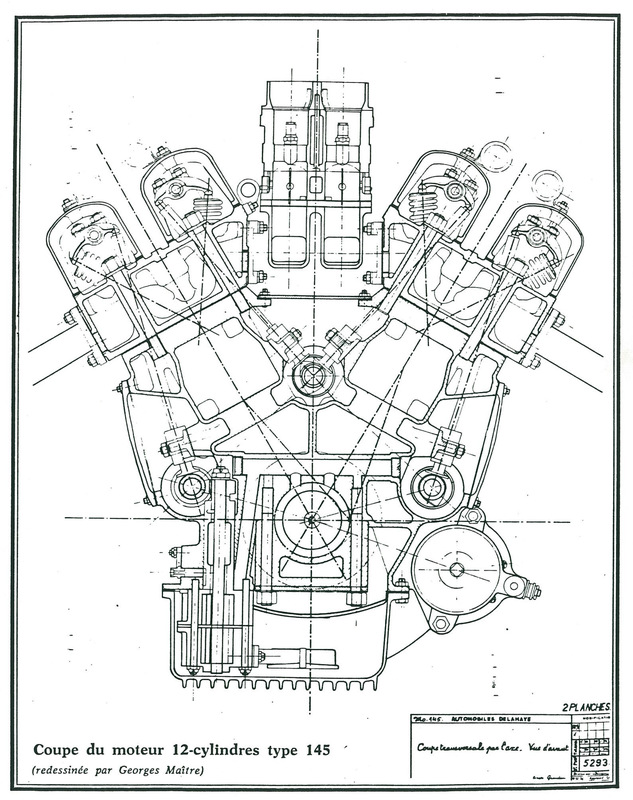 Drawing shows the narrow slots used in each sleeve of the Voisin engine. 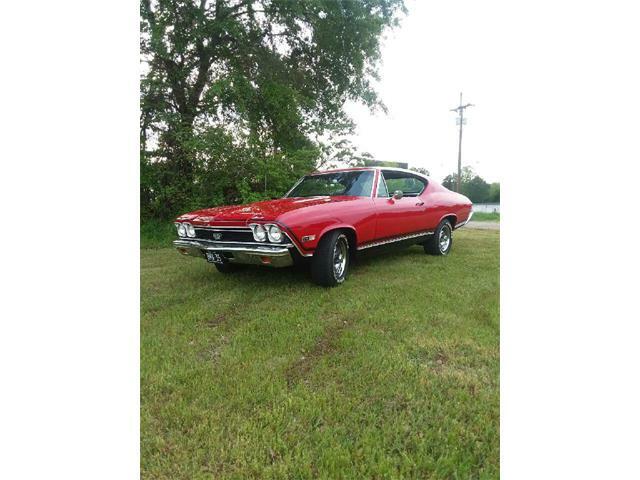 As they aligned at different times during each stroke they would offer intake on one side and exhaust on the other. 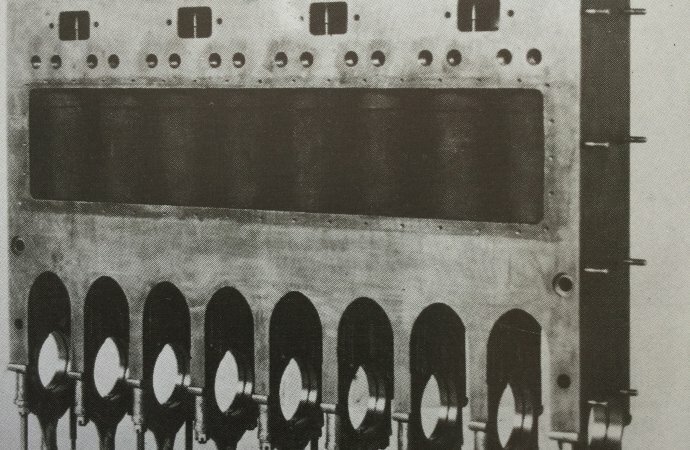 The width of the slot was the measure of time allowed for breathing to occur. 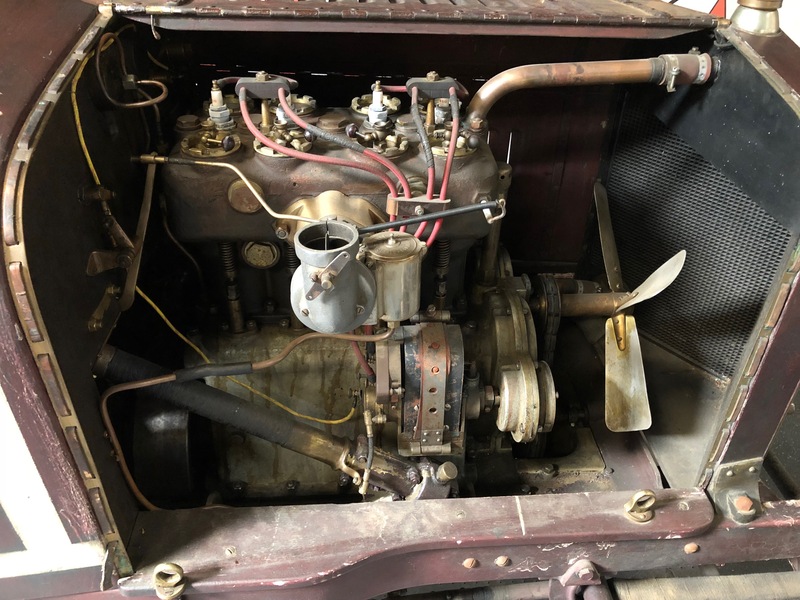 The 1924 Bucciali B6-C24 was a 2-liter sohc 6-cylinder racing engine, the internals of which remain a mystery to your author — as are most sciences related to Bucciali engineering. 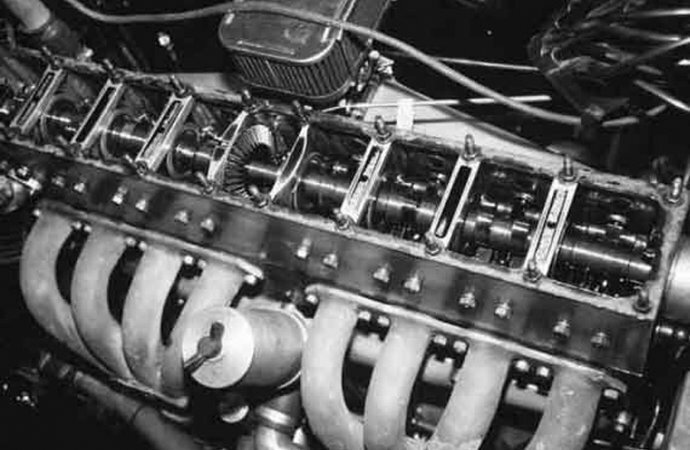 Chenard-Walcker won the first Le Mans 24-hour race in 1923. 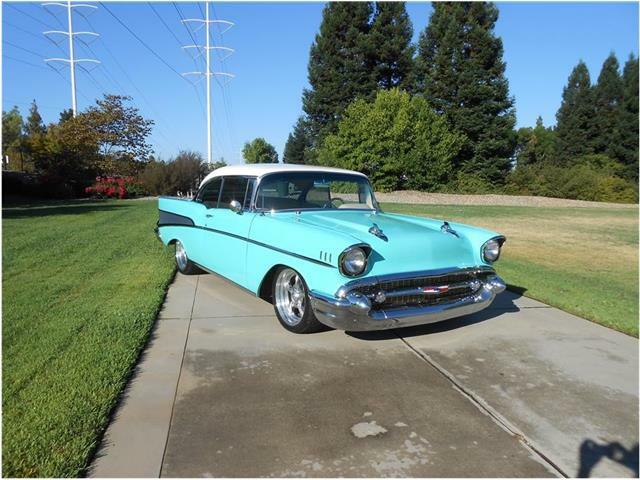 They used an sohc 3-liter four for their first, second and seventh place finishes. 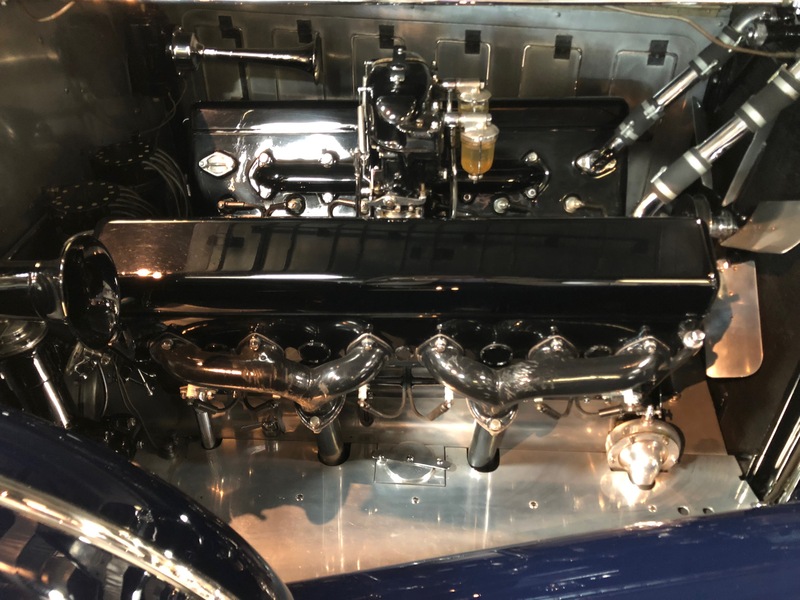 This is the 2-liter production sports car version of the engine. 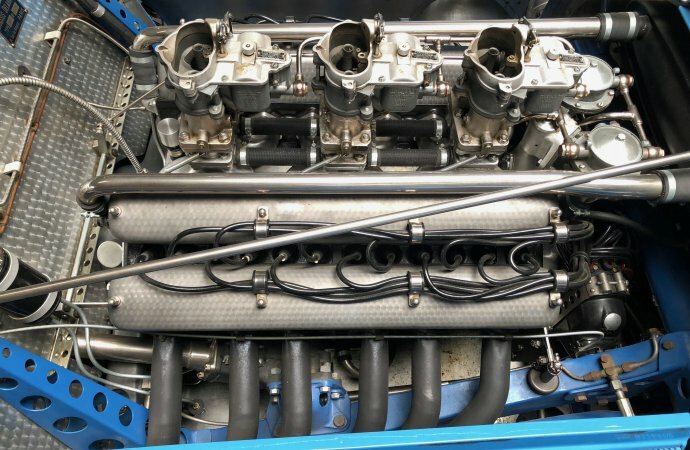 Bugatti’s Type 37 with the designer’s traditional 3-valves per cylinder, monoblock (no separate head) 4-cylinder in its supercharged 1.5-liter sohc grand prix format. 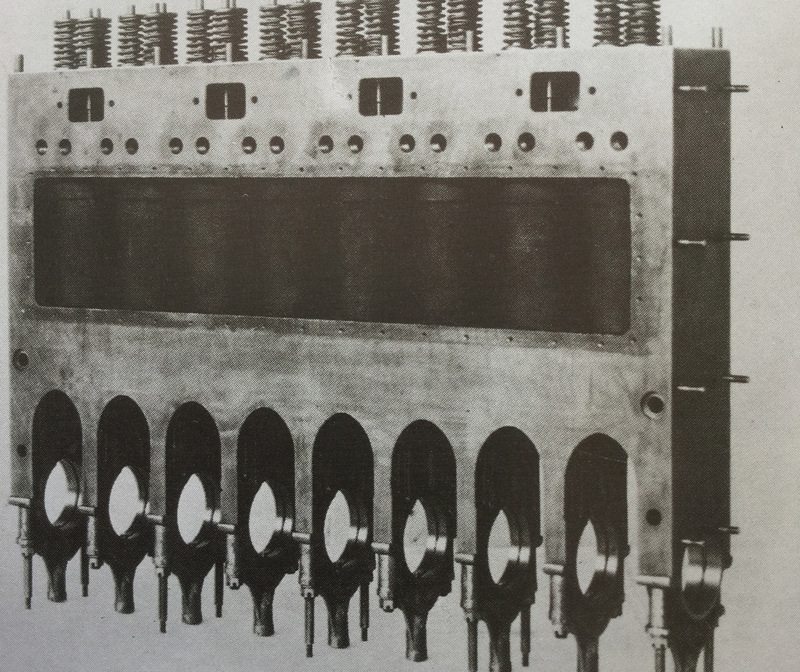 All the early Bugatti 8-cylinder engines used a pair of these cast iron blocks on an elongated aluminum crankcase. 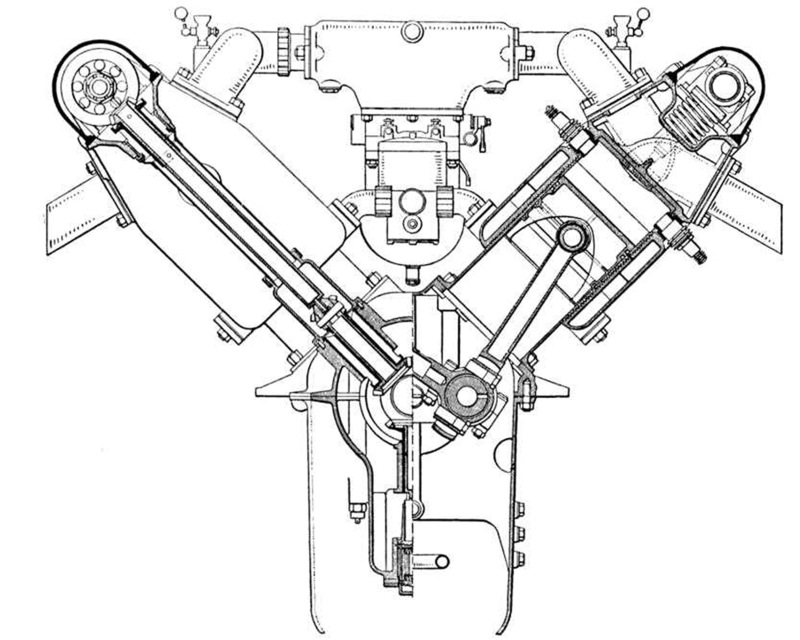 Shown in the 1923 Type 35 drawing below is the adjustable finger-follower valve gear Bugatti used on these 3-valves per cylinder blocks. 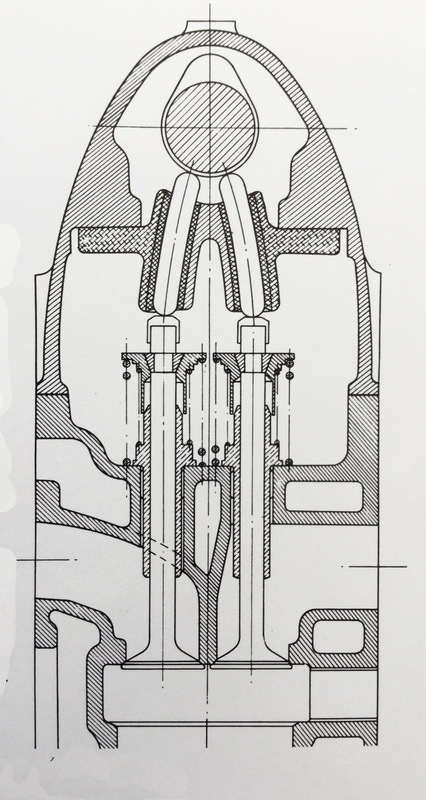 Note the mushroom combustion chambers used to make room for the valves. 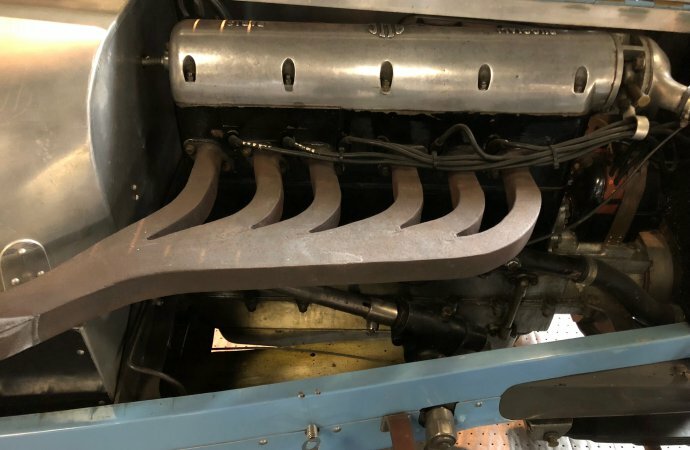 Dozens of important design details are left out of this brief essay — not the least of which is the engine’s 1,000 racing victories. 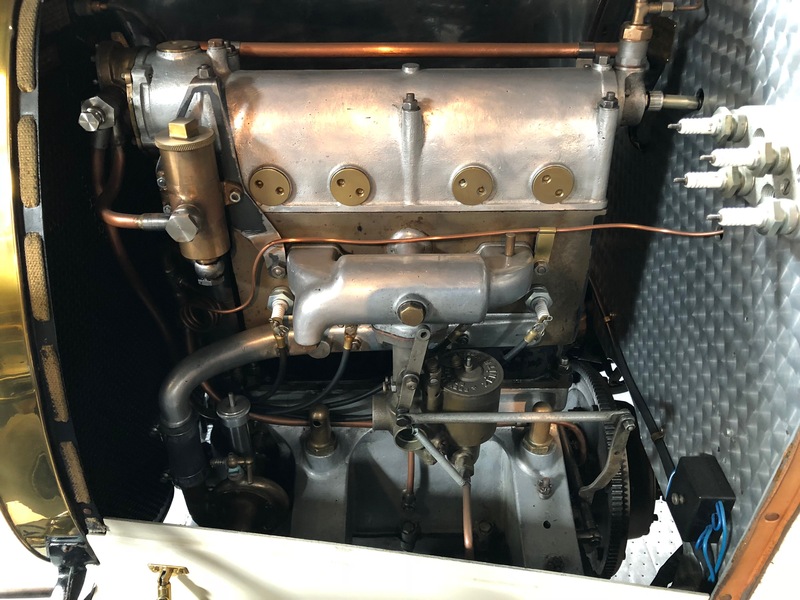 The first 3-liter 8-cylinder production engine Bugatti created for luxury coachwork in 1929 used the same two 4-cylinder blocks, but for the 3-liter he separated them and put the vertical shaft drive up the center between them. 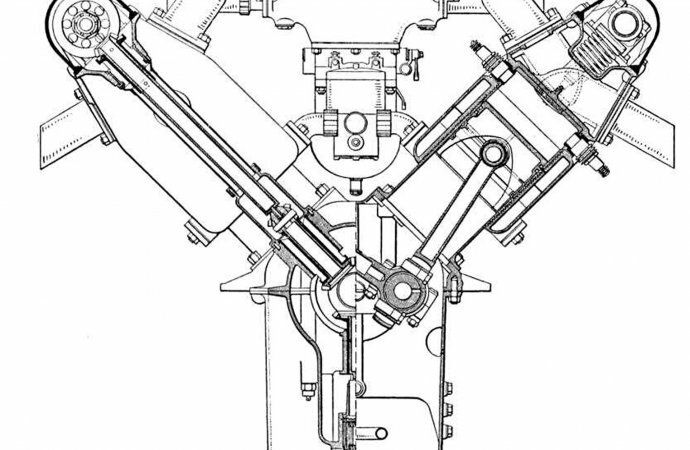 The cam drive bevel gear can be seen in the photo with the cover removed. 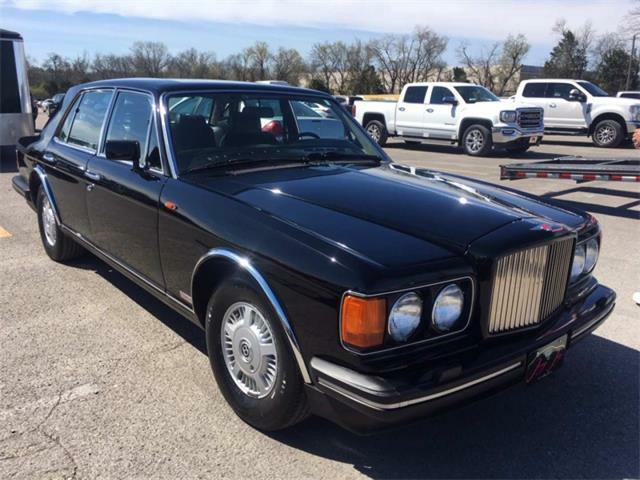 Type 46, Le Petit Royale was the accepted name for Bugatti’s replacement for his gigantic Royale. 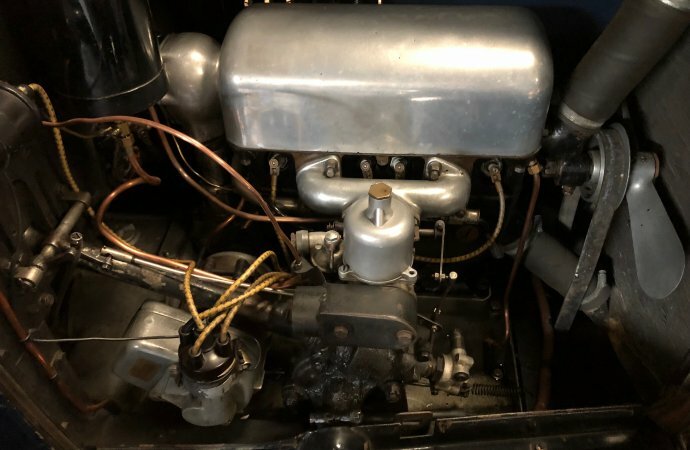 With much of the engineering that made the 12.7-liter Royale an extraordinary automobile, Type 46 was also a great, fast car — with a broad range of luxurious coachwork. 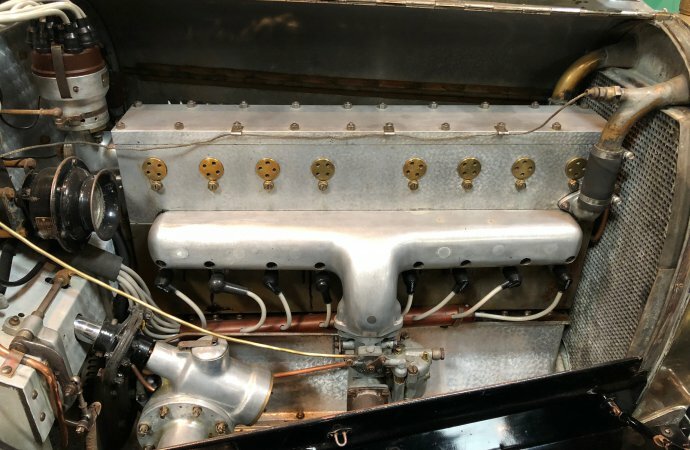 The new 5.3-liter straight eight, was a single monoblock (still no separate head) with nine main journals included in the casting, unique for Bugatti. 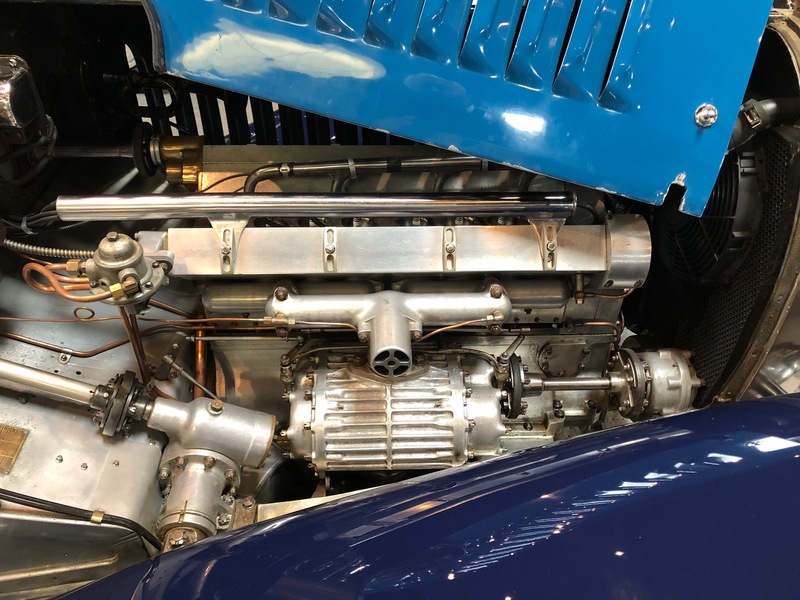 The simple and often victorious 1937 Delahaye 135 ohv 6. 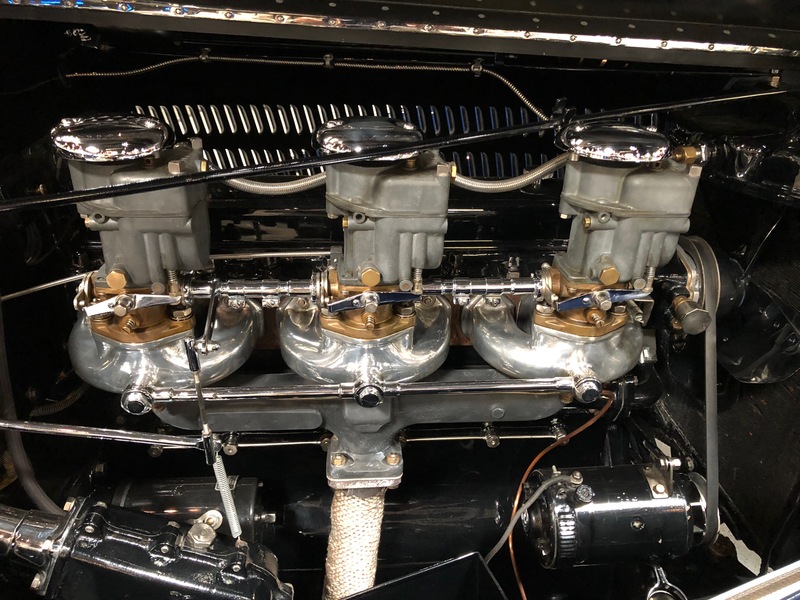 Note the three U-shaped intake manifolds with one carburetor each and the three individual exhaust headers. 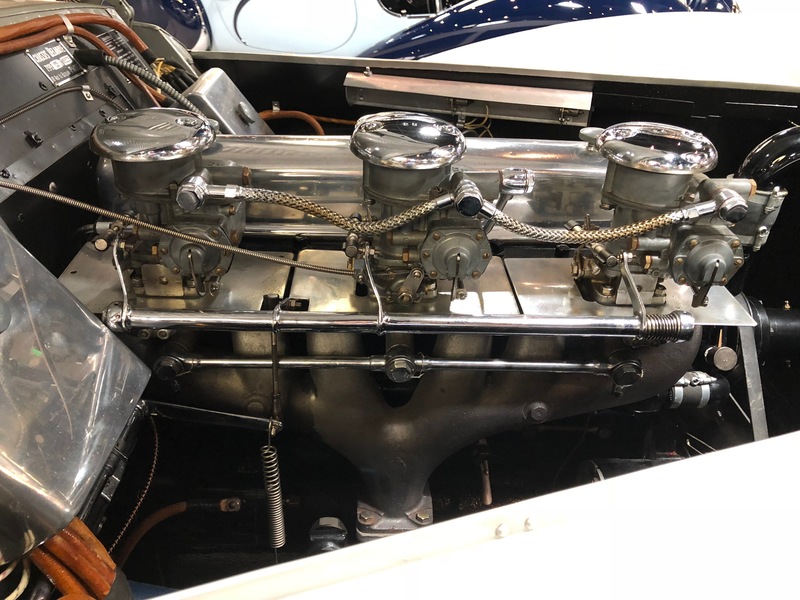 The 135s finished second and third in the Le Mans 24-Hours in 1937, and were first and second in 1938. 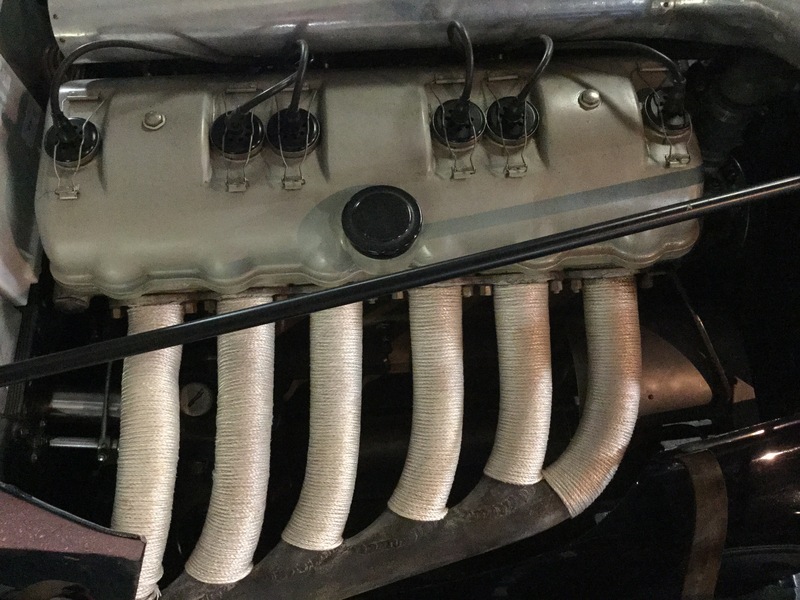 After the war, the 1951 235 luxury sports car seems to have used the same head, but with the same ports used in reverse; six exhaust ports and three intake ports. 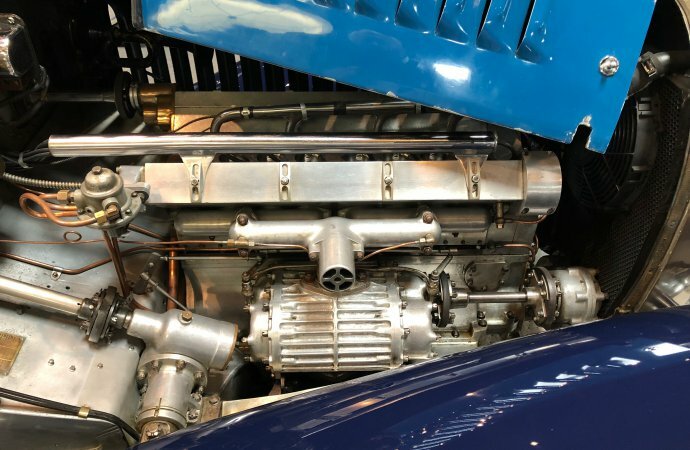 The 1937 Delahaye 145 V-12, shown here in the famous winner of the Million Franc prize. 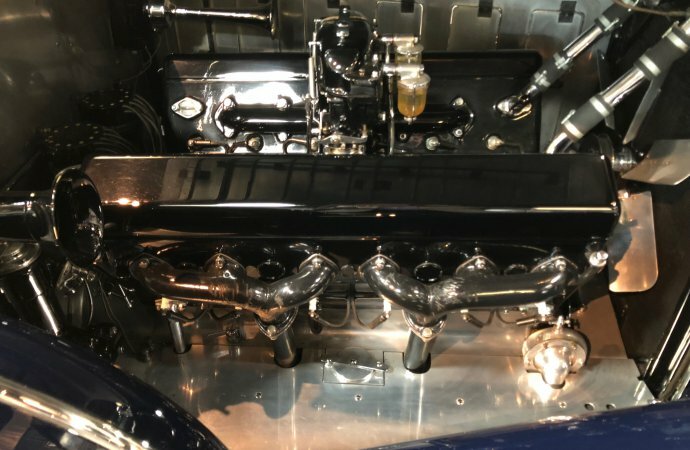 The clever valve mechanisms included three cams, the central one with push rods for the intake valves on each head and a pair of cams low in the block for the exhaust valves on each head. 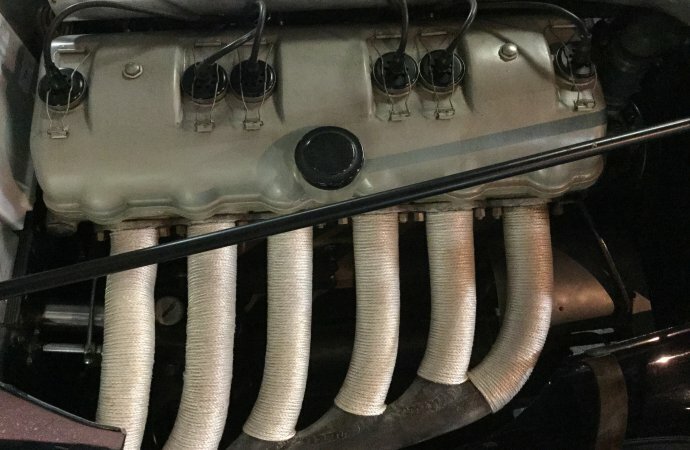 Perhaps the reason was to keep the mass of hardware necessary to rotate four cams could be eliminated and all the 3-cam mass was low in the car. 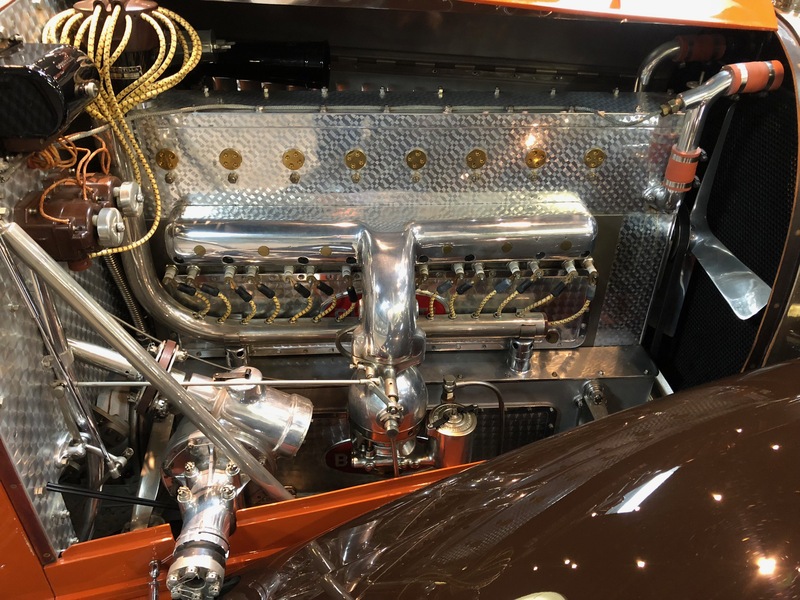 The Mullin Automotive Museum recently held its second (and first in two years) celebration of the mysteries of vintage French power with many of the museum’s fabulous examples of French coachwork displayed with their hoods propped open. 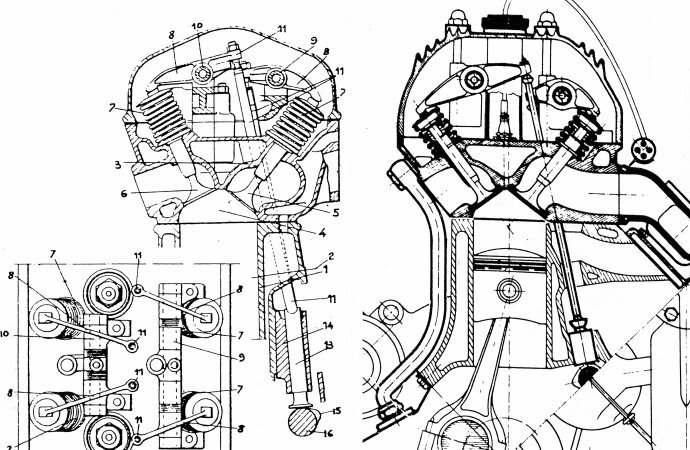 Exposed were engines that are rarely — if ever — seen by even the most ardent motor heads. 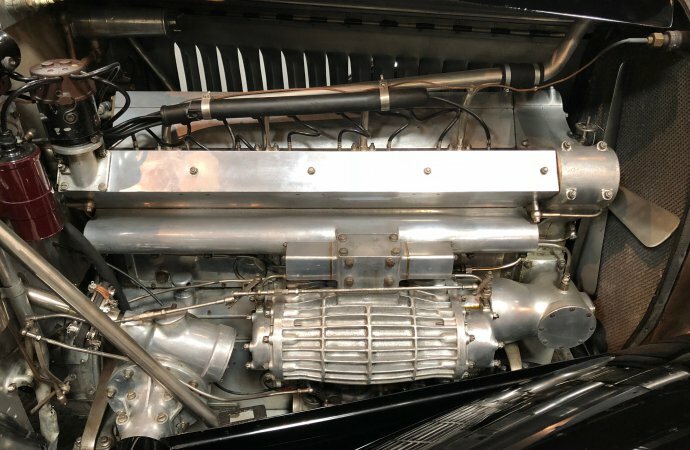 To open the festivities, I was asked to repeat my engine-tech Powerpoint presentation from 2016. 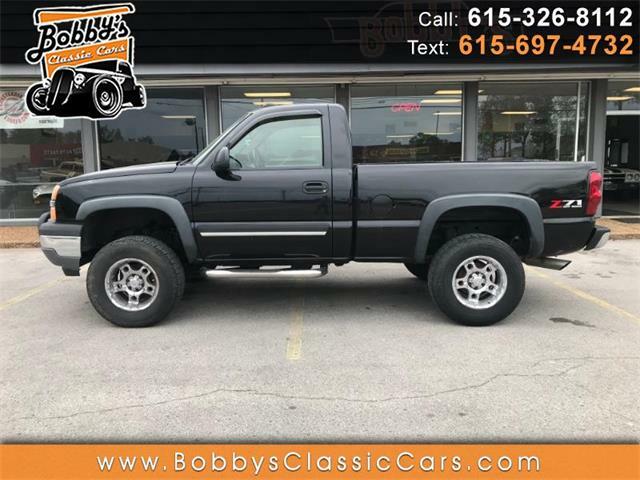 That took the first 45 minutes of the limited window of time. 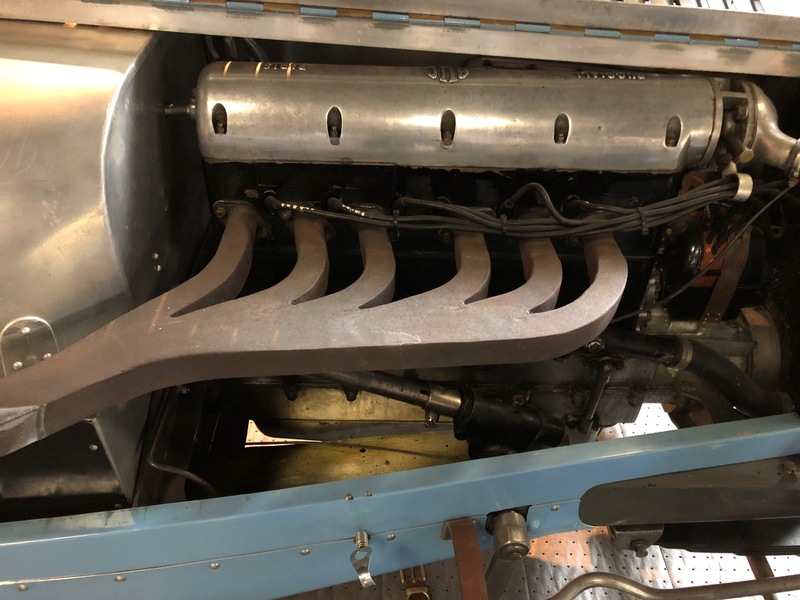 I was gratified that the assembly remained engaged through the show before being released into the galleries with heads full of newly discovered information. 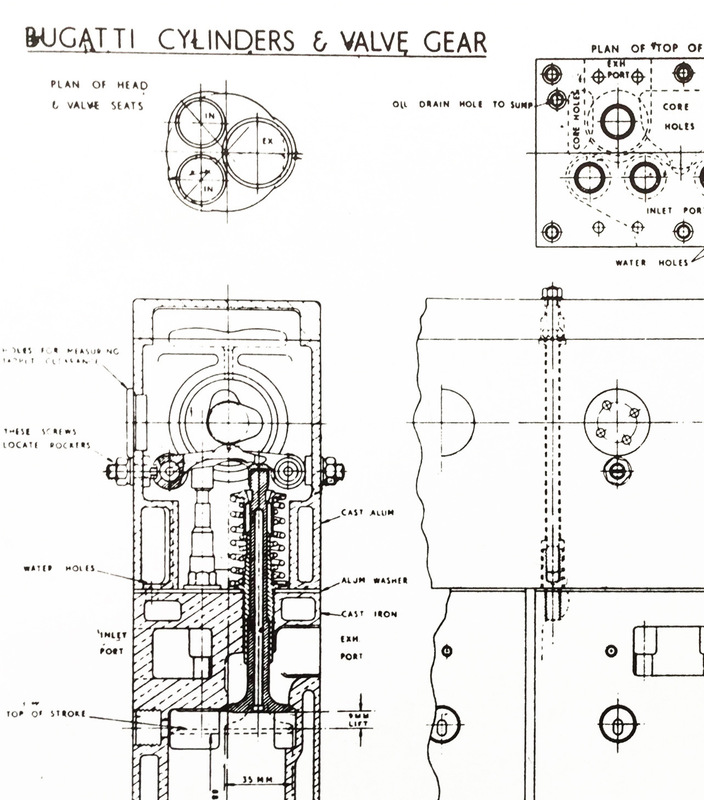 Mullin docents were committed to help illuminate what the guests saw on the screen, but now in real metal. 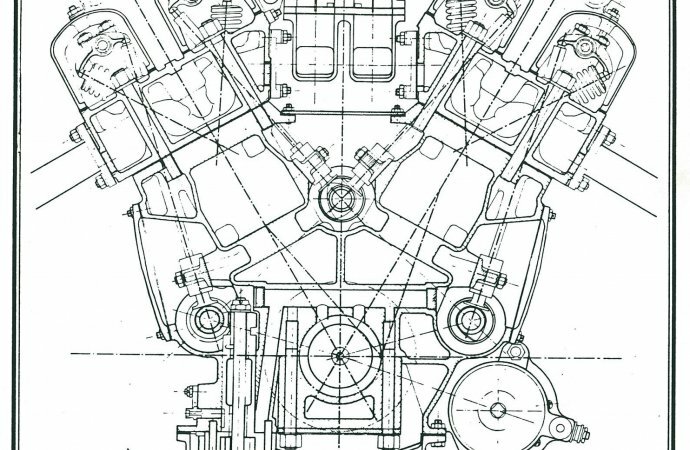 Our gallery includes engine photos from the day, along with the technical drawings from the prelude presentation.